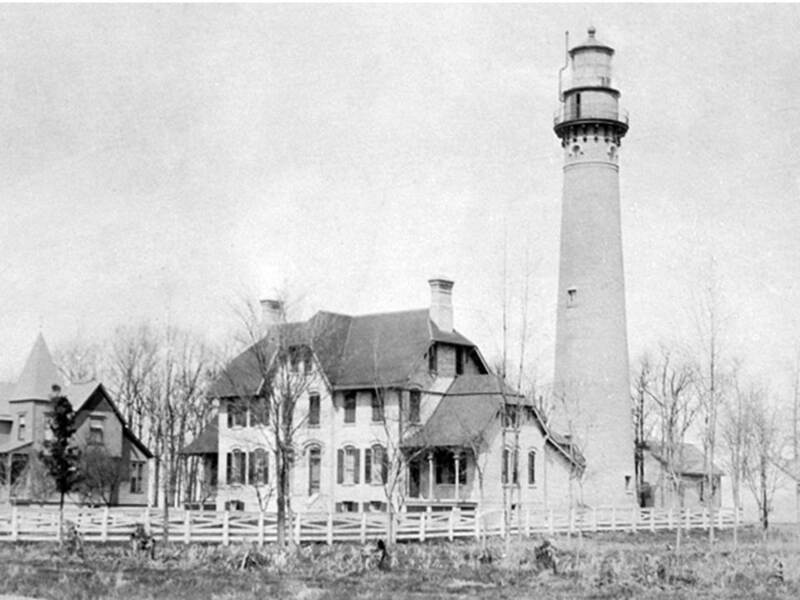 In the late 19th century, the lifesaving crew and keeper at the Life Saving Station at Evanston, Illinois on Lake Michigan were unique. The keeper, Captain Lawrence O. Lawson was the only official person on the lifesaving crew. The other members were students from Northwestern University, who when not on duty at the station were busy with their studies. The station itself was located on the grounds of the Northwestern University campus. On November 27, 1889, the steamer Calumet, a large propeller of over fifteen hundred tons and comparatively new, traveled from Buffalo bound for Milwaukee, Wisconsin with a cargo of coal. While navigating her way along a shallow part of the Detroit River she hit an anchor on the bottom and sprung a leak. Later, her captain and crew said that the leak happened when the Calumet struck a pile of boulders near Bois Blanc island which had become a hazard to navigation because of a year of low water in the Detroit River. The damage was so serious that Captain Green, her commander, headed toward Detroit so he could repair as much damage as possible. There, he took a steam pump on board to keep the ship afloat and enable him to reach Milwaukee. This maneuver probably would have saved her if mother nature hadn't intervened. After the Calumet passed through the Straits of Mackinac and headed down Lake Michigan, a fierce storm blew up. The air boiled with blinding sleet and snow and the thermometer dropped to ten degrees above zero. The waves pushed up by the wind slapped the Calumet so roughly as she chugged south that the leak broke out again. The leak widened so quickly that even the pumps working to their full capacity could not stop it. To make the situation even worse, Captain Green could not find the lights of Milwaukee Harbor and had to decide whether or not to push on through the storm to Chicago. He changed course and started toward Chicago, but in the meantime the pump gave out. The steamer filled with water and it seemed like it was about to sink any minute. Captain Green decided to run her ashore to save the lives of the crew. By now, the Calumet was so heavy with water and coal that she grounded heavily on a shoal about a thousand yards or more from the shore, on the night of November 28, 1889, about half past ten. To keep the Calumet from being pounded to pieces by the waves before morning, Captain Green ordered the valves in the bottom open so that she would completely fill with water and remain steady. The wind howled and the waves rushed against and over the Calumet, leaving a coating of ice in their wake. The eighteen crew members spent the long night clinging to their doomed steamer. They could not launch a lifeboat and no help could reach them from shore until daylight. The Calumet had run aground off Fort Sheridan, a recently established military post about twelve miles north of Evanston and the nearest life saving station. Mr. A.W. Fletcher, a Highland Park resident, the first to discover the Calumet, quickly sent a message to the Evanston police. On November 28, 1889, Thanksgiving morning, about a half hour after midnight, Light keeper Lawrence O. Lawson received a message from the Evanston police. The message said, "There is a large vessel ashore at Fort Sheridan. Come!" next train would be going north. "Not before 7:30 in the morning," the night operator told him. He thought for a few minutes, and then remembered that a freight train from Chicago would go by without stopping at about 2:00 a.m. The night operator wired a request to the train dispatcher at Chicago to tell the train engineer to stop at Evanston and take the station crew to Highland Park. The train was due to reach Evanston in 35 minutes, so there was no time to couple on cars that could carry the lifesaving equipment. Keeper Lawson sped through the snow to the nearest livery stable and hired teams to haul the surf boat and other equipment to Fort Sheridan. Then he hurried back to the life saving station and mustered his crew. He left one man behind to wait for the other patrol to come in and then hurried with the boat and other equipment down the snow-covered country road. The arrangements completed, Keeper Lawson and four other men raced to the railroad station. The police officer who had delivered the message joined them and they all boarded the train that had just pulled up. A mechanical problem on the train delayed their trip so that it was 4:00 a.m. before they reached Highland Park. Here Mr. Fletcher, the first man to see the wreck, met them and guided them the two miles to the scene. At this point the Lake Michigan shore consisted of a steep cliff about 80 feet high, split here and there by deep ravines filled with a dense growth of trees and underbrush that extended down to the water's edge. Mr. Fletcher became confused in the darkness and storm and lost his way. The rescue party had to climb down the bluff by making their way through several of the ravines, but finally at 5 o'clock they reached the shore. The surf men built a brush fire to serve as a beacon to the crew of the Calumet and to keep themselves warm while they waited for daylight and the arrival of the lifesaving equipment. At 7:00 a.m. when the boat and gear arrived, it was light enough for the men to see that the Calumet was a large steamer, just like Mr. Fletcher had said. She was submerged almost to the main deck and the rescuers could see that the crew on board could not hold out very much longer. They had to act and act quickly or the men would die. The steamer did not look to be more than four hundred yards from shore, so Keeper Lawson decided to try to reach her by line instead of risking the lives of his crew or the destruction of the boat. The waves pounded the foot of the bluff and left very little foothold on the narrow strip of beach. They fired two shots from the gun, trying to shoot the line out the crew of the Calumet, but the line fell far short of the ship. The steamer was much further out than Keeper Lawson had estimated and beyond the working range of the lines. Taking a boat out to the stranded crew was the only thing left to do. The men got ready to launch a boat into the tossing waves. About fifty soldiers from Fort Sheridan, commanded by Captain C.G. Penny, and a group of civilians headed by Mr. Fletcher joined forces and came up with a plan. They decided to slide the boat into the water from the ravine where they had built the fire. Willing hands grabbed axes and cut a way down the gully through the undergrowth and brush wide enough for the boat. The men also used picks and shovels to cut steps in the stiff blue clay to help the men climb down to the beach with the boat. Sturdy hands completed these two jobs, and the soldiers and civilians brought the boat to within a few feet of the water. The gully was located about three hundred yards south and leeward of a point directly by the wreck. The men had to drag the boat well to the windward along the narrow shelf of beach at the foot of the bluff. A heavy surf rolled in, so the only way for the men to launch the boat was to watch their changes between the breakers. They had to progress slowly and most of the time waist deep in cold, icy water. They were in danger of being swept off their feet and out into the lake by the waves. Twice the boat completely filled with water and had to be emptied out. Often it partially filled with water that the men had to bail out. The waves struck the boat broadside and hurled it hard against the bank despite the efforts of those on the outer gunwale to prevent it. Despite all of the dangers and obstacles, the men got the boat to a point windward of the steamer and as soon as its bow could be pointed lakeward, the crew sprang to their places at the oars. When the next waves lifted the boat, the soldiers pushed, the oars were put in motion, and the rescue party set off. As they crossed the inner bar, the rescue crew rowed into a huge breaker that nearly capsized the boat. The shock of it hitting was great enough to almost throw Keeper Lawson overboard from his post past the steering oar. Before he could recover, a second wave dashed over the boat and filled it to the seats. This made the boat almost unmanageable and for a while the men had all they could do to keep the boat floating and steerable. 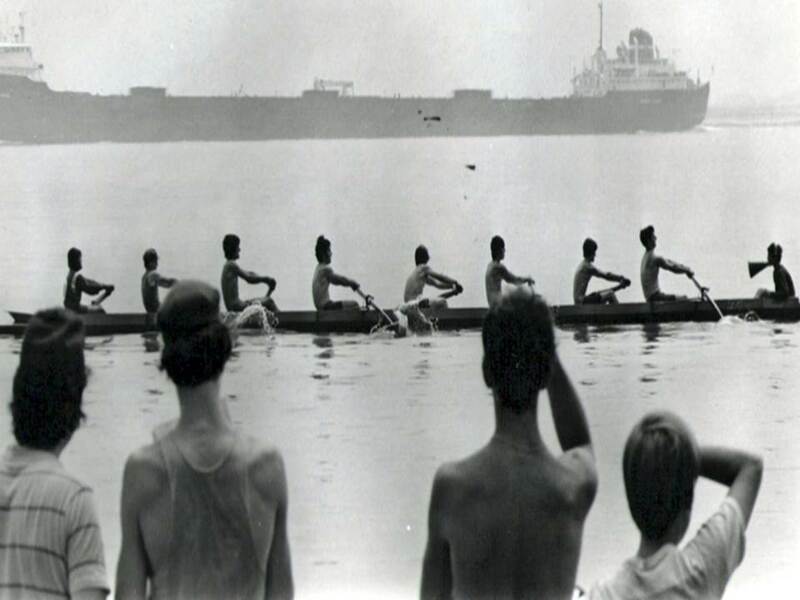 Nevertheless, they kept up a strong and steady pulling on the oars and the stroke oarsman bailed until the craft was free of water. They managed to keep going and soon were beyond the heaviest breakers. In the meantime, the current had pulled them far to the leeward, and they had to pull long and hard directly into the wind. Flying spray from every wave left a glaze of ice on everything it struck, and the men's clothing was soon covered. The oars constantly slipped from the oarlocks and both the oars and oarlocks were covered with ice. The temperature had fallen to 22 below zero. The rescuers kept going, even though their clothing froze stiff and their boat became shrouded with ice. Finally, their boat reached the Calumet. The crew of the Calumet was clustered forward in and about the pilothouse stiff and half dead from the cold after being exposed to it for so many hours. The Calumet too, was encased in an icy shroud which grew thicker and thicker as the waves battered her. At last the rescue boat drew close enough to the bow of the steamer for Captain Green to throw them a line. Every watcher on shore and those on board the steamer and the rescue boat sighed with relief as the rescue boat drew alongside the ship. Captain Green hastily secured the line to a seat to hold the boat in position. The rescuers took six of the Calumet's crew into their boat. Each put on a life preserver and the boat started for shore. The strong current sent the boat far to the leeward and the boat had to land a full quarter of a mile south of the launching point. The people on shore helped the crew out of the boat, and the surf men and their rescuers were taken to the fire on the bluff. Here the ice was beaten from their frozen garments and they were given hot coffee. While the rescued and the rescuers were reviving, the soldiers and civilians emptied the boat of the water it had taken in coming through the surf, and dragged it to a point well to the windward of the sunken steamer. They readied it for another trip. The surf men, much refreshed by hot coffee, again made their way down to the boat and launched it again. Learning from their previous error, they headed the boat more to the current and were not swept so far to leeward by it, reaching the wreck more quickly. Altogether they made three trips out to the wreck, rescuing six men per trip. They saved the entire crew of eighteen men and none of them were even seriously frostbitten. By the time the rescue was finished, the surf men were in almost as bad shape as the men they had rescued, and so numb they could hardly walk. The soldiers took charge of the boat. They hauled it back up the bluff, carried it safely to the wagon and put it in charge of the teamster who took it to the railroad station. The surf men drank more hot coffee, and then took the first train to Evanston, arriving early on Thanksgiving afternoon. Under the humane directions of Captain Penny from the Sixth United States Infantry, the Calumet crew was sent to the barracks and comfortably provided for until they could be settled elsewhere. A few hours after her crew was rescued, the Calumet broke up completely. The following morning there was nothing left of her but her stem and stern post standing up out of the water. Everyone who witnessed the rescue of the 18 crew members of the Calumet and Captain Green was certain that if it had not been for Captain Lawson and his student surf men, every last man on the Calumet would have perished. On October 30, 1890, the Marine Review reported the United States Life Saving Service awarded the first gold medals to an entire crew to the Evanston crew for its rescue of the Calumet crew. Each of these men received the gold medal from the United States Life Saving Service. Captain Lawrence O. Lawson, the lighthouse keeper, also won the gold medal. The crew members who received the gold medal were George Crosby, William M. Ewillg, Jacob Loining, Edson B. Fowler, William L. Wilson and Frank M. Kindig. All of them except Captain Lawson were students at Northwestern University.